This is our 8th year for the Wine Walk and it has grown each year. 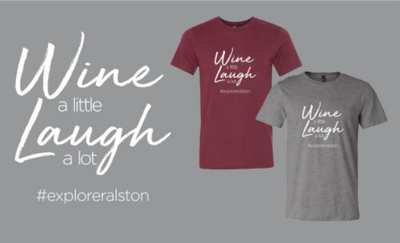 This is an opportunity to explore historic Downtown Ralston and sample some great wine! Pre-registration is available now online. This will secure your glass regardless of your participation in the actual event. Pre-registrations after April 1st does NOT guarentee you a glass. This simply means you have pre-paid and are able to participate. 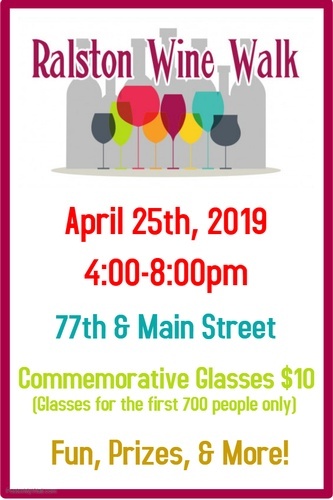 If you are unable to make the event, we will hold your glass at the Chamber Office for pick up on April 26th or later. Due to us pre-ordering your glass, we will not be issuing refunds should you not be able to attend the event. 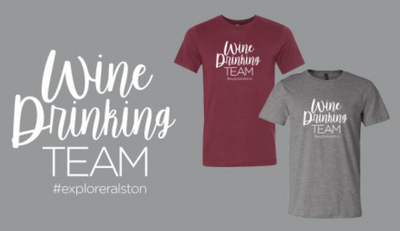 During registration, please list what color & sizes you would like if you want to purchase a Wine Walk tshirt! We will have the shirts available for pick up with your wine glasses on the day of the event beginning at 4pm. First 700 people will receive a commemorative wine glass.